Dissapointed González-Cobos leaves FC Marbella | Marbella Marbella – Adelante! 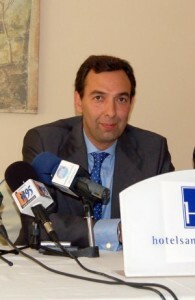 Rafael González-Cobos, former president of FC Marbella, spent less than a year with the club. Rafael González-Cobos ended his term as president of Marbella’s football team on Friday, weary, he says, of investing so much money for so little response. The now former president of the organisation will not sport a penny more, he adds, which means that the next manager must find the money to pay the salaries of the players through their contracts. The entrepreneur, who resigned after less than one year, leaves behind a team that is steadily descending into the third division. He recently told the press his reasons for leaving the club. “People here believe that things are free and that they will be free forever. I have made a financial commitment to saving the club, and my investments have not been matched by other institutions. When you have neither internal nor external support, there comes a point where one says enough’, he said. As one solution for the poor investment and poor team performance, he suggested that ‘not one single payroll should have been paid until the team had achieved positive results’. ‘I am what pulls the cart, and there is a limit to what I can pull’, he continued. One reason that González-Cobos resigned may be that he felt cheated. He does not deny that he may have felt cheated, but he carefully avoids making such a charge directly. He says he has no reason to think about whether he has been deceived, and that it would be “childish” to justify his resignation by making such a charge. ‘I am old enough not to say that, unless something very blatant has occurred. I do not feel cheated by anyone. What I feel is that I have made an effort, and I have not been matched. I made a payment to help them through times of crisis’. González-Cobos said he had thought about resigning for several days before actually reaching the decision, but the last defeat at home to Roquetas was ‘the straw that broke my back’. He said that that loss was what made him realise that there were few options left for the team to save itself. Instead of dwelling on blame and recrimination, González-Cobos said, “I will now dedicate myself to my own company, where my workers will be paid every month, and my family, not to a project that has no potential’.